With the first rounds of the College Championships being played this weekend take a look some best games in each division. 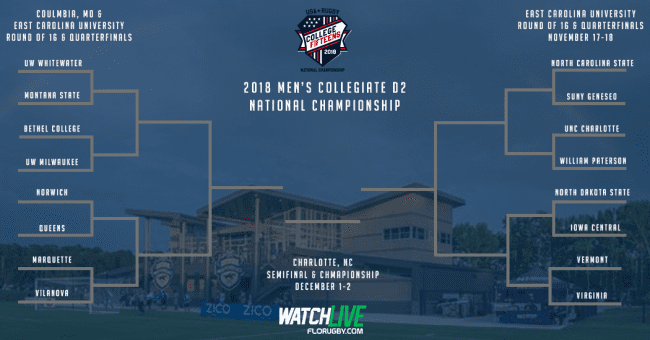 This weekend the first round of the 2018 College Fall and National Championship series will be taking place across the country. 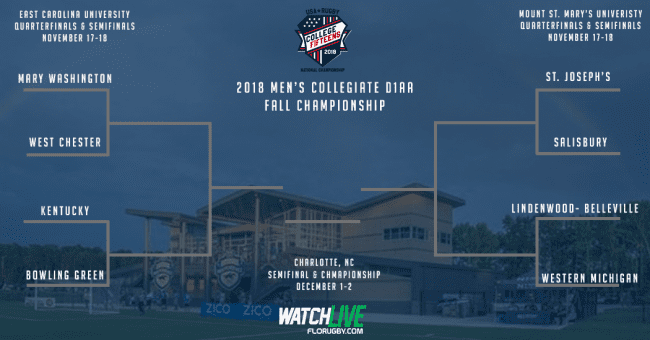 Teams will descend upon Columbia Missouri, East Carolina University, Mount St. Mary's University and Vassar College, as they launch their bids to make it through to the Championship weekend on December 1-2 in Charlotte North Carolina. The Men's D1AA competition looks to be its most open and competitive field in recent memory and this weekend's quarterfinals and semifinals look to be tightly contested battles. 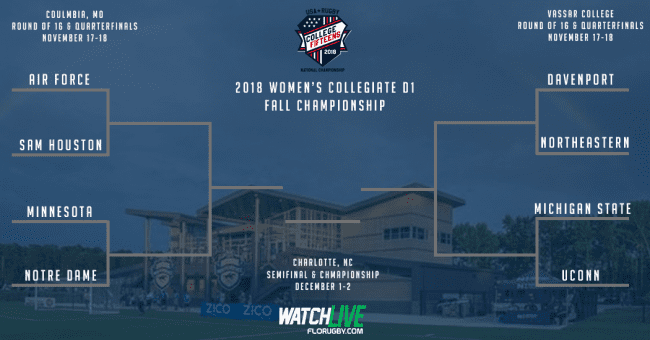 Last year's Fall Champion, Mary Washington and runner up, St Joseph's both return this year, and the path is set for each of them to make a run back to the championship game. However, what is shaping up to be the best match of the opening round is last year's 3rd and 4th place finishers facing off, in Bowling Green taking on Kentucky. Bowling Green advanced through into this year's bracket as the number two seed from the Mid-American conference. They've gone 5-1 on the year, with their only loss coming to Western Michigan, 29-24. Outside of that loss they have been dominant over their opposition, winning by an average margin of 45 points. However, they're under no disillusionment about the challenges Kentucky will pose for them. Coach Tony Mazzarella explaining, "We know they're a tough team, we know they are a quick team, we know we're going to have to defend." Defending Kentucky isn't something that many teams have been able to do successfully this year. They average just under 50 points a game and have been led by Freshman Bryce Reardon who has scored five tries in three games for them. The Wildcats have a strong blend of youth and experience on their squad this year, which should serve them well in this campaign. On the other side of the pitch, Bobby Kisken, a junior, will be leading the efforts for Bowling Green. Kisken's contribution hasn't been through the scoreboard, rather it has been through his leadership as captain. Mazzarella knows that when the going gets tough this weekend his team will turn to Kisken. "He does a great job of being a little bit of a director...he does a great job of settling everyone down when they need to settle down and firing them up. He's just a great all-around player." Both teams pride themselves on their physicality and their ability to tighten defensive screws when needed. It will be a bruising affair with the winner going to face the winner of the Mary Washington West Chester game. Plenty of familiar faces have returned to the women's D1 bracket, including the last three champions, UCONN (2015) Air Force (2016) and Davenport (2017). If UConn and Davenport win their initial games this weekend they will set up an intense clash in the semifinal; and if Air Force wins, they will come up against the winner of Notre Dame and Minnesota. 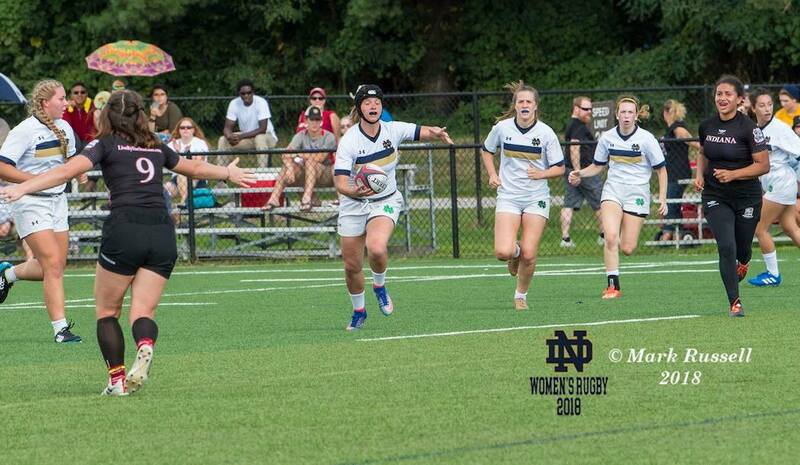 Notre Dame, were last year's runner-up, after catching many off guard by beating UConn in the semifinals. They return this year, but the team that is coming back is markedly different from the side that made it so far, a year ago. "We had a big group of seniors last year, that all started together as freshmen. They went through the process of getting better each year and now we're back to that same thing, so it's a whole new group with only three returning players." Notre Dame's coach Ricardo Ramirez explained. Their opponent first up this weekend, will be Minnesota. Similarly, to Notre Dame, Minnesota's season came to a halt last year after they encountered Davenport. Minnesota played them in the first-round last year and this year, coming up against second placed team from last year, their task isn't much easier. Despite this, Rebecca Radtke Minnesota's coach is excited for the challenge. "Nobody wants "easy". Last year's experience was last year's experience. College club rugby gives you that excitement of every year not knowing what you are going to get. We are a different team than we were last year." Both teams are leaving last year's results behind them and are stepping into this weekend with a sense of belief and they are choosing to focus more on themselves rather than their opponents. When asked about what she expects to see from Notre Dame Radtke simply responded with "The unexpected". Ramirez offering a similar perspective, "With the group that we've got its more focusing on us and not worrying about them." Each squad will be looking for a team effort to pull them through in both the quarterfinals and the semifinals. Radtke, keeping her cards close to her chest, mentioned that the catalyst to their success this weekend would be her team's ability to get all fifteen players to give their full effort. For Ramirez's side, it will be about overcoming the nerves. He's expecting there to be butterflies in their stomachs, due to their youthful nature, so for Notre Dame to succeed it will be about harnessing those butterflies. Things get a bit more crowded in the D2 brackets with Round of 16 matches and quarterfinals taking place this weekend. This year's bracket sees more of a shakeup than has been seen in years gone by previously. Last year's runner up VMI out; but still the three other semifinalists return to see if they can take down UW Whitewater. One team in particular, Norwich, is chomping at the bit to have a crack after they fell just short against VMI in last year's semifinal thriller. Before they get their chance to improve upon last year, they'll first have to get by a tough up and coming Queens side that is gunning for a home semifinal and potential championship match. Looking back on last year for Norwich isn't going to be much of an option for them. After suffering a similar fate, losing in the semifinals and then winning bronze, in 2016 they had set their sites on getting to the championship in 2017. With that not coming to fruition Robert Weggler and his men have had to change their sights a bit. "We graduated 18 seniors and ten starters, so there has been a little bit of surprise that we've gotten this far with a lot of new guys. Key takeaways are to just play the full eighty minutes and let the scoreboard take care of itself." Weggler, Norwich's coach noted. With so much turnover, keeping it simple could be their best bet. Queens, similarly to Norwich have a young squad. They are a new program that is only 20 months old. With such a new program this has been their first year of experiencing competitive matches. It has been a success, so far but after finishing third in the Cardinal Conference there is still a long way to go. Queen's coach Frank McKinney explaining, "23 out of the 28 guys on our team are freshmen or sophomores. We're young so really this is new for us." With both teams lacking in experience, especially on such a large stage the coaches will be keeping their game plans simple this weekend. For Norwich, they have a tremendous respect for their opposition's rugby IQ and their resiliency, so for them it's about playing from whistle to whistle. As Weggler said "If we don't show resilience and play 80 minutes they'll wind up scoring more points than us, like they did against Furman and Navy's second side. I know we will have a challenge ahead and we'll play the full 80 minutes and let the score take care of itself." McKinney offered a similar response, keeping his team focused on two elements of the game, tempo and defense. It will be a fast-paced game and teams with near perfect conditions forecast the game should turn out to be a fantastic display of running rugby. 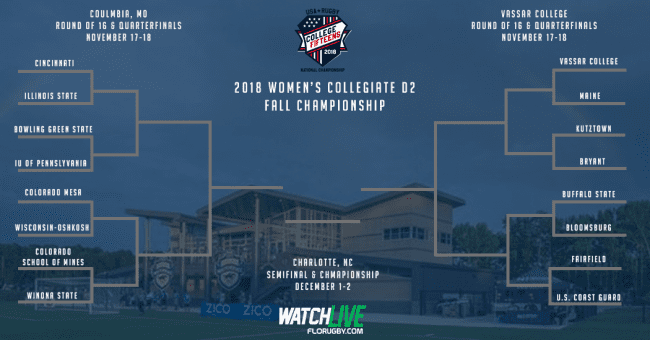 All four of last year's semifinalists return to the playoffs this year in the Women's D2 bracket, however, their road back won't be an easy one. The quality of play around Women's D2 has been at its highest point in recent memory and teams will be entering this playoff series with a firm sense of belief. Two of those teams are Bloomsburg and Buffalo State. Two teams who made it to the playoffs last year, but fell short of their initial goals. We learned that the competition outside of Western New York is stronger than what we typically see," begun Buffalo State coach Emily Edwards "We need to adjust our game plan accordingly." Part of the improved game planning has been a renewed focus on aggression around the breakdown. Last year they were unable to match up Vassar's dominant forward pack, but this year they hope to see their work up front pay off. For Bloomsburg, it will be about focusing their efforts and not letting the pressure get to them, or as their coach, Kevin Castner put it "not choke". "We need to not put so much pressure on ourselves. That's the simple way about it. We certainly did not perform up to our abilities." To help lead their efforts behind performing up to their standards they will be looking at a full squad performance. Castner explained that they all know they need to step up and not let the occasion get the better of them. Christal Smith from Buffalo State has been a weapon all year and will look to use her talents to influence the game over the weekend. Edwards describing her as amazing. "She's amazing on the field off the field. She scored five tries last weekend, and is really good at keeping the team motivated. Ingrid Peralta in the forwards is also very motivational and keeps everybody going in the game." Keeping it simple is the name of the game for Bloomsburg this weekend. Simplifying the approach they take into the weekend will pay dividends for them. Castner believes that if his team can just remember what got them to this stage of the season and don't try to be too fancy they will enjoy more success than they did last year. Buffalo State knows that it will be about the team working together over the weekend and listening to each other on the field. With cold wintery conditions expected in New York the simpler the game plan the better. The conditions will make everything that much harder over the weekend and whichever team is able to stay composed and execute the fundamentals will walk away victors.